Have you ever wondered -- perhaps as you were trying to reason why the middle east seems so full of people whose main busi-ness in life is to kill others who think and believe differently than they do -- just where Iraqi men come from? 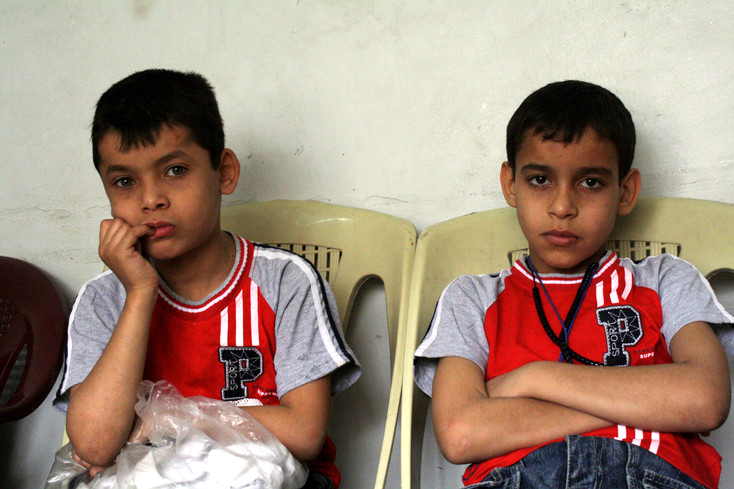 The answer, it would seem, on the basis of the new docu-mentary IN MY MOTHER'S ARMS, is from abused Iraqi boys. (If you choose to replace the world Iraqi with Saudi Arabian, Lebanese, Iranian, Libyan and on and on, I am not sure that there would be much difference in the end result.) The un-cared-for and un-cared-about children of the Middle East seem doomed to become the next generation's sacrificial cannon fodder, in this case with explosives strapped to their chests. The above quiet rant is the result of my having viewed this exceptionally moving (and depressing) documentary, from brothers Atia and Mohamed Al-Daradji (shown above with Atia on the right), about a good man named Husham Al Thabe, who, with a very few friends/volunteers, cares for a group of orphans in Al-Sadr City, one of the least safe districts of Iraq. 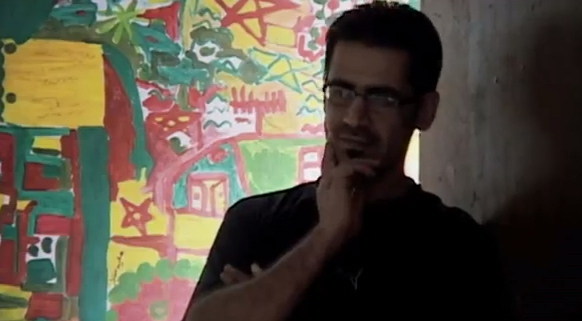 From the film's begin-ning and throughout, we see Hasham on the phone and in person, literally begging for funds to help run his "safe house" for these orphans. 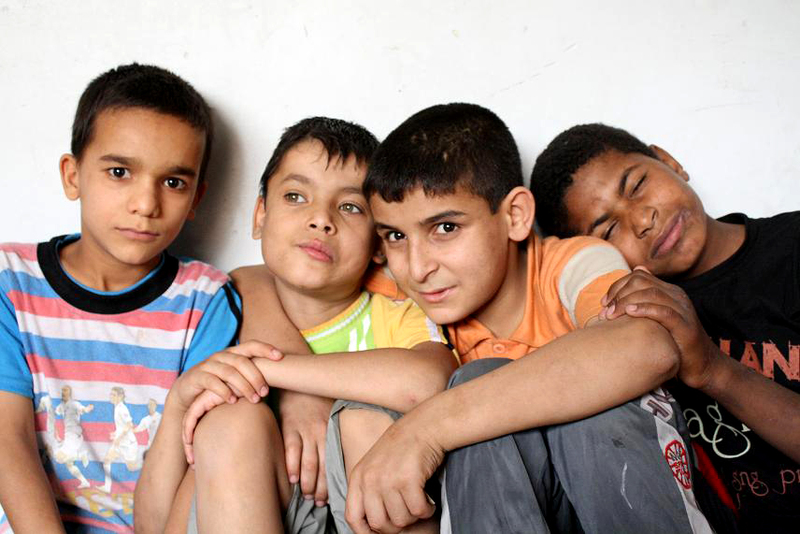 The filmmaking brothers follow Hasham and his kids: he to his home, where his family wants more of him and less of those orphans; the kids at play and to their school and later to a theater project aimed at giving them (and one boy in particular) greater life. That boy is a stunningly beautiful, hazel-eyed child named Saif (above), who has been brought to the edge of trauma and who-knows-what-else by the loss of his parents and subsequent life on the streets and perhaps in state-run orphanages -- which Hasham feels are to be avoided at all costs, as the boys are almost certain to be abused in these places. 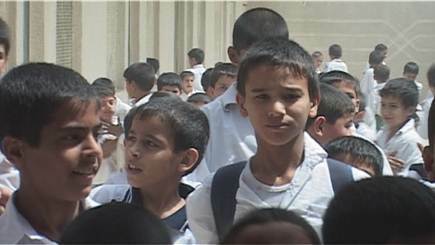 The boys themselves -- these includes 32 different youngsters, another of whom named Mohammed, looks to be a champion swimmer and diver -- would appear to do just about anything to stay out of these state-run institutions. In one scene, we see a child talking about what happened to him there, and it's appalling. The state itself will give Hasham (shown above) no help. It would rather spend its time, money and effort waging sectarian war. So the state officials tell Hasham to simply give up his 32 boys to a state-run home. He won't, and continues to look anywhere, everywhere for funding. At one point along the way, a local mosque appears to be a possible benefactor, followed by -- hello! -- the United Nations. And, oh, do the boys get excited over this! 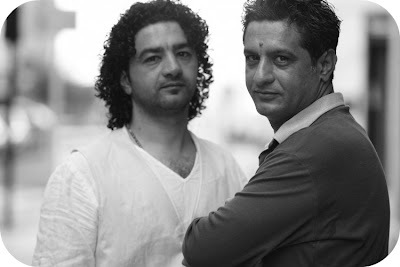 The Al-Daradji brothers capture Hasham and his kids in all kinds of moods and activities. At one point, I think it's Saif who insists, "I want to eat alone." And in the midst of his other problems, Hasham shakes his head and mutters, "On top of everything, I have moody teenagers..." Yes, all this -- and those ever-present power outages, too. It is especially interesting to see and hear the various responses Hasham and his boys get from the male populace regarding his crisis. One fellow appears to breakdown in tears and sobs over the closing of the orphans safe house; another seems happy to donate money for a cause this just; yet another, clearly "religious," find an excuse by claiming that what Hasham is doing somehow goes against his religion. One of Hasham's care-givers has already been shot dead. Bombs go off perilously close to the safe house. Why? Is there any rhyme or reason here? Certainly not to us westerners. But we do catch a curse being muttered that uses Saddam Hussein's name, something that would not have happened before the toppling of the dictator, I suspect. 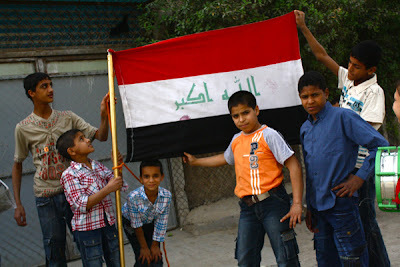 The movie tells us that there are now more than one million war orphans in Iraq, and though the film does not raise this question, I think any intelligent viewer cannot help but ask it. What is America's responsibility in all this? Wasn't it our own Colin Powell who noted, "You break it, you own it," or words to that effect. 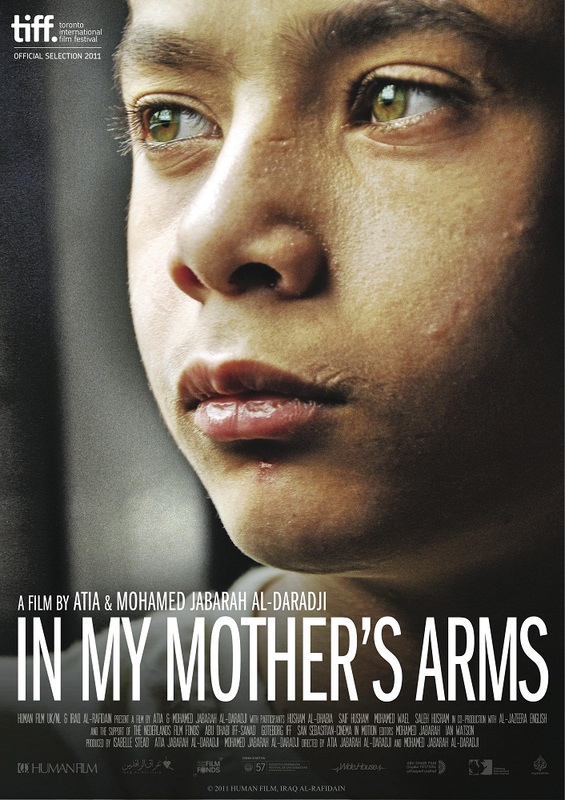 In the theater scenes, like the one above, songs are sung, and the boys, especially Saif, come back and back again to the lyrical refrain, "in my mother's arms." Eventually, that phrase can break your heart. Finally we're left with the sense that the state of Iraq would rather make war on itself than turn its boys into productive men. (We won't even get close to what Iraqi or other middle eastern women have in store.) And yet men like Hasham, below, do exist there, along with our film-making brothers, who are willing to go on record about them. So I guess there is hope. Of a sort. 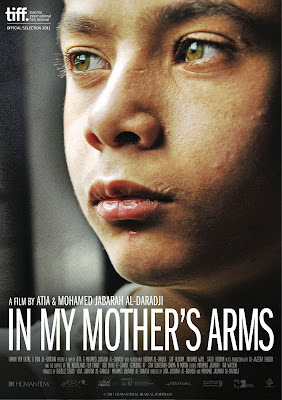 In My Mothers Arms opens this Monday, October 8th and runs through October 14, showing nightly at 7:30 PM at the Maysles Cinema, as part of the Cinema's Documentary in Bloom series. Click here for directions, tickets or more information.